Thorns change time of July 13 match to 4 p.m. The Portland Thorns have announced that the start time for their July 13 home match against FC Kansas City to 4 p.m. pacific time. It had originally been scheduled for 2 p.m. The game will be held at Providence Park in Portland. Gates open at 3 p.m.
To read the Thorns official statement, click here. 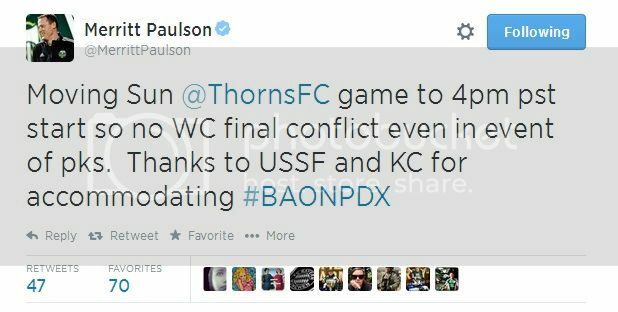 Thorns owner Merritt Paulson announced the time change via twitter. The announcement was met with wide support, including from Thorns midfielder Amber Brooks.